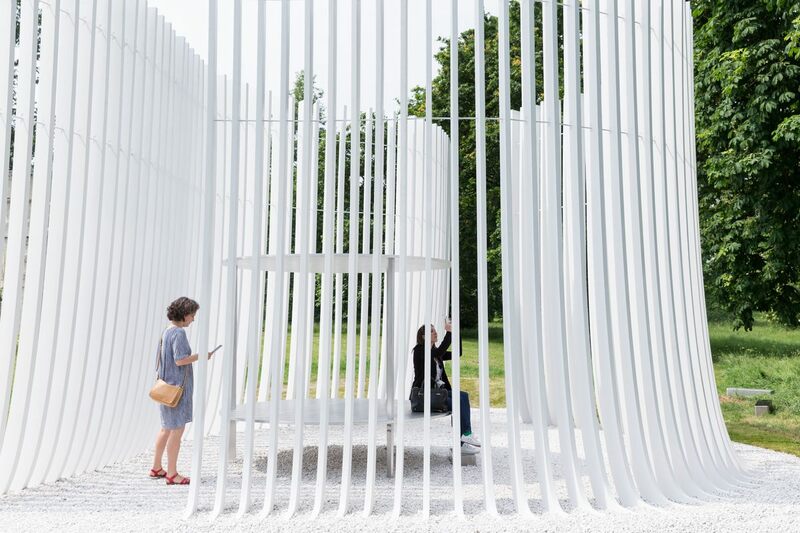 Perched on the lawn of the Serpentine Gallery in London’s Royal Kensington Gardens, the annual Serpentine Pavilion has been a summer highlight for Londoners since its inception in 2000. 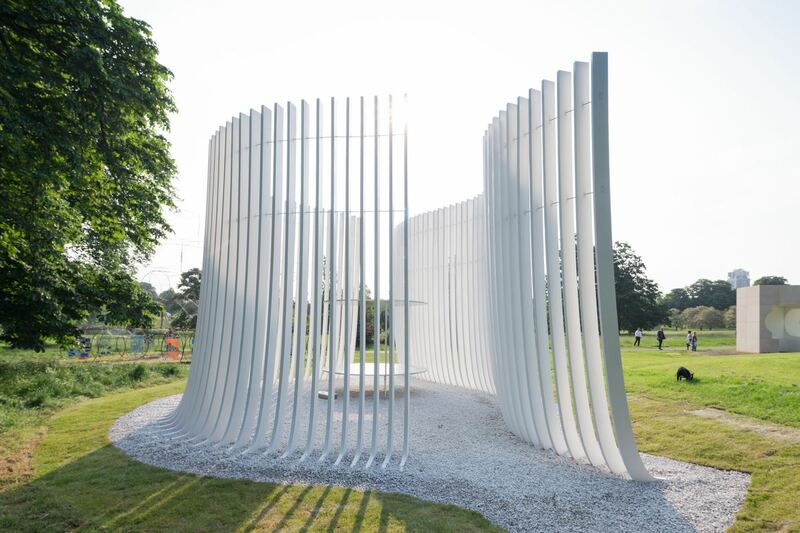 The first Pavilion, which enjoyed a four-month residency, was created by Zaha Hadid. Since then the site has entertained notable architects including Daniel Libeskind, Rem Koolhaas, Frank Gehry, and Ai Weiwei with Jacques Herzog and Pierre de Meuron. I visited the site on the morning of the press launch to view this year’s Pavilion, designed by Bjarke Ingels Group (BIG)—an “unzipped” wall of stacked fiberglass square frames—as well as the new additions to the “Serpentine Architecture Programme,” as it’s now called: a series of “Summer Houses” designed by Kunlé Adeyemi of NLÉ, Barkow Leibinger, Yona Friedman and Asif Khan. The curators and architects of the summer pavilions. Image credit: Robert Urquhart. 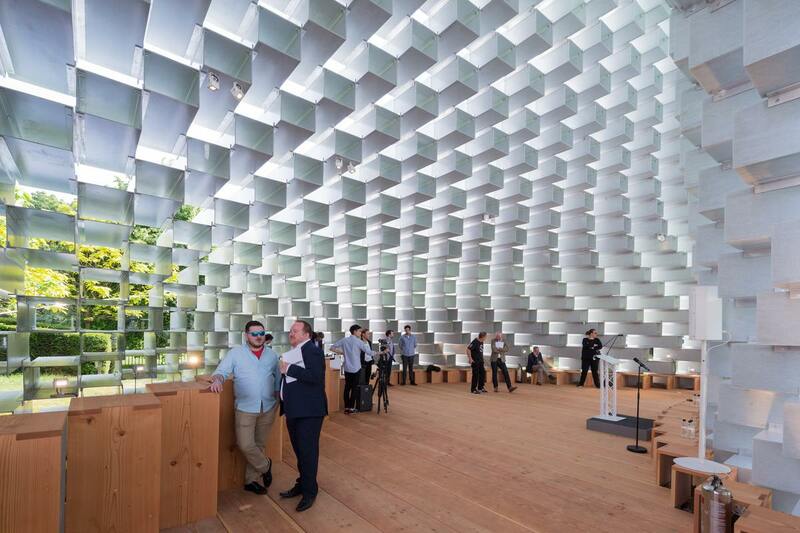 BIG’s Pavilion, like its precedents, occupies a 300 square meter site directly in front of the main Serpentine Gallery. The brief for the Summer Houses, on the other hand, comprised designing a 25 square metre pavilion in dialogue with the adjacent Queen Caroline’s Temple, a summer house built in the mid-18th century by William Kent. 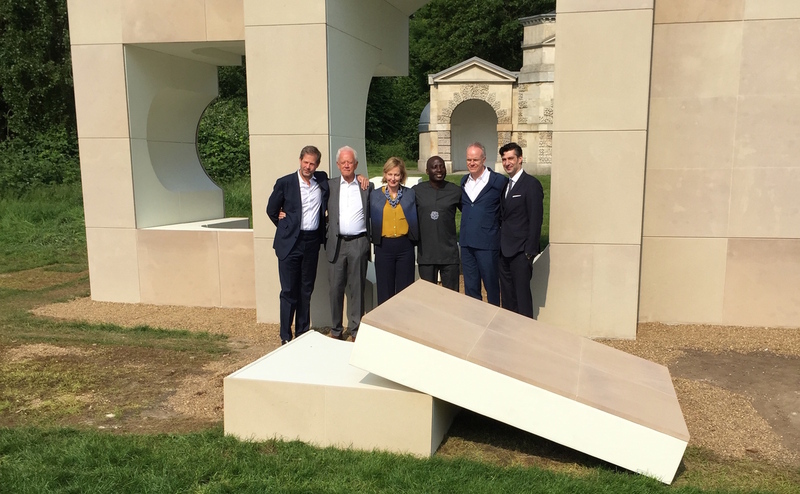 The press launch began with Julia Peyton-Jones, Co-Director of the Serpentine Galleries and the institution’s much-respected figurehead for the past twenty-five years. This will be Peyton-Jones’ last Pavilion launch, with Yana Peel set to assume her role later this year. 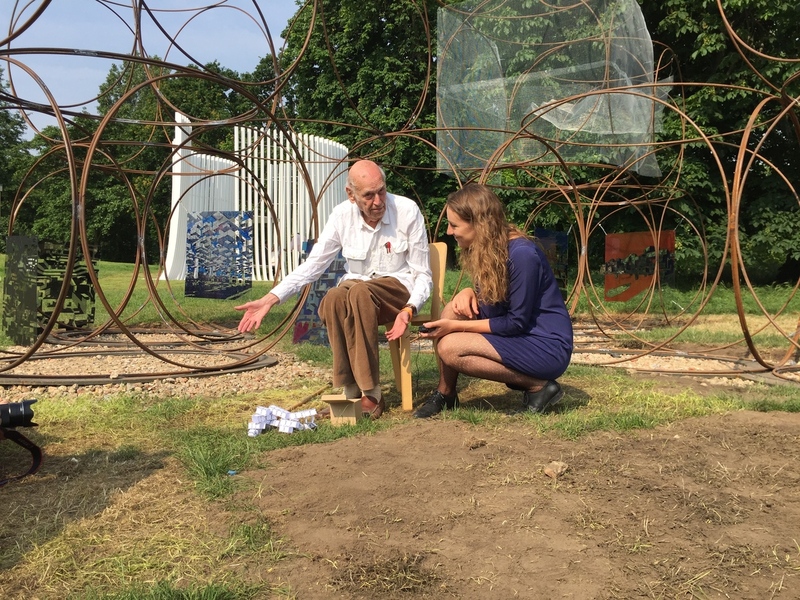 Peyton Jones got straight down to business, casting aside any thoughts that the addition of the Summer Houses to the programme constituted a swan song or ego trip. The work becomes a pure manifestation of that architect. 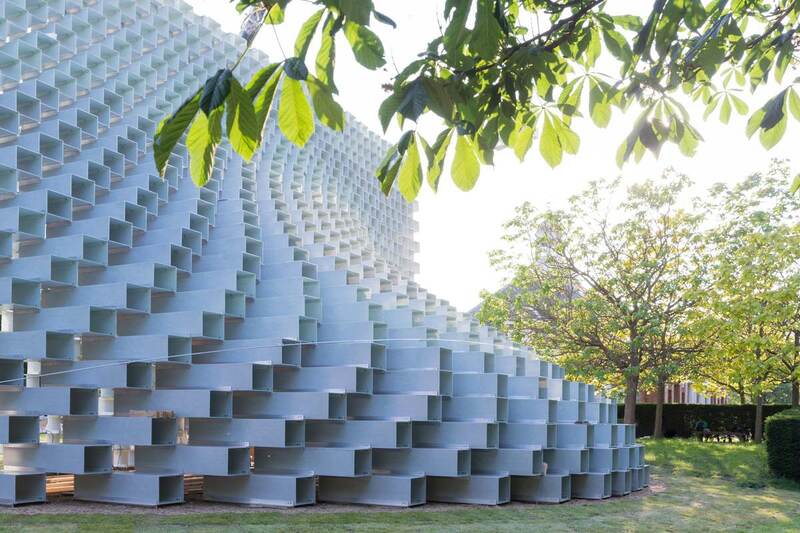 Why does the Serpentine have an architecture programme in the first place? “We were shocked to find how many architects had not built in this city or even in the UK,” Peyton-Jones explained. Bjarke Ingels, founder of BIG, then introduced his pavilion, picking up on the nuances of placing architecture adjacent to an art gallery. “As architects we almost always work in a situation that is so saturated with existing constraints that the project becomes very much about the place we are working in and maybe less about a pure manifestation of our ideas about architecture,” he stated. Ingels then drew attention to the fact that the building is designed to be viewed from many different angles and with multiple purposes in mind. A detail of the exterior of BIG’s Pavilion. Image credit: Robert Urquhart. you could create any imaginable form with carefully designed and planned mass-produced elements, almost like creating difference out of repetition. 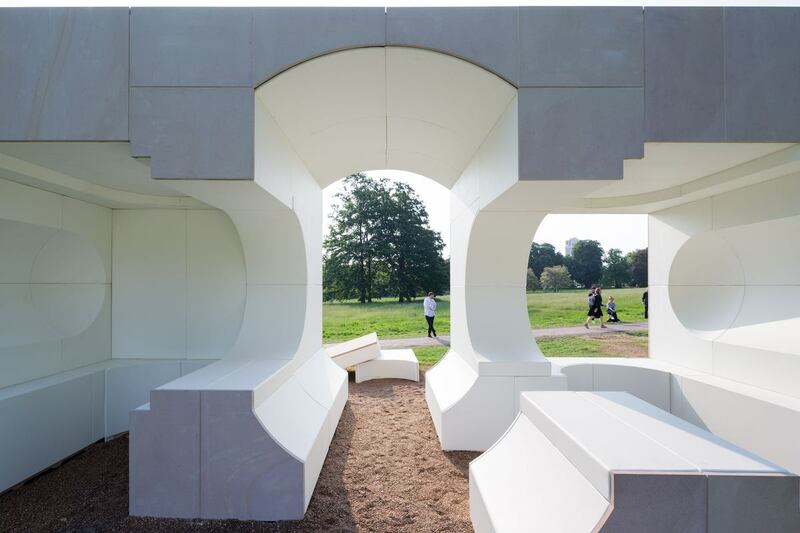 Ingels was keen to point out that the pavilion has a “shelf-life” beyond its four months in Kensington Gardens, after which the work will travel to Asia and the United States. Built from prefabricated, mass-produced elements, the Pavilion is incredibly light and can be disassembled, completely unscathed, and shipped very easily. Ingels ended by invoking a personal hero, Jørn Utzon, best-known for designing the Sydney Opera House. 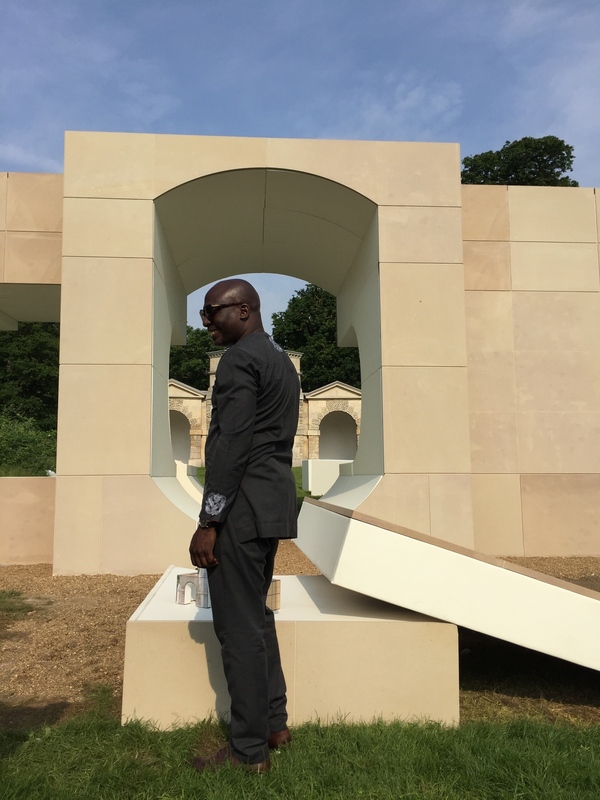 We then moved on to hear from the architects behind the Summer Houses, just a two-minute stroll from BIG’s Pavilion, beginning with Kunlé Adeyemi of NLÉ. 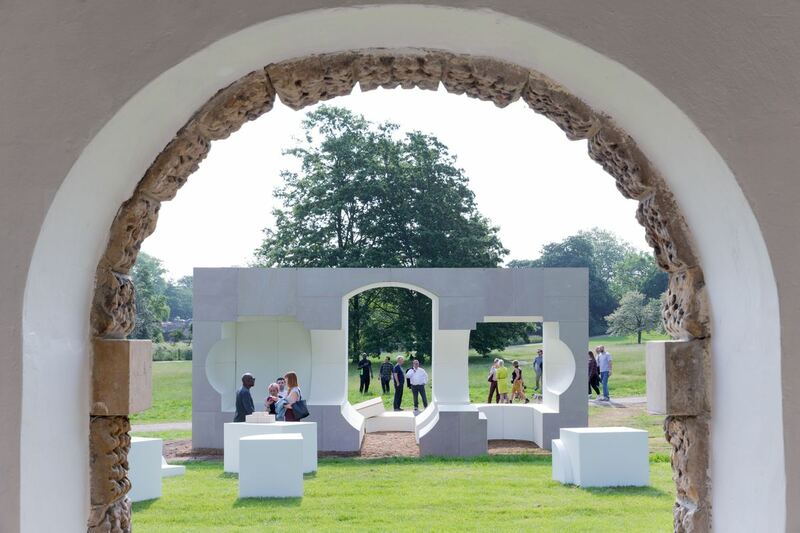 His structure is a respectful play on Queen Caroline’s Temple, taking the neo-classical proportions and turning its negative spaces into classic architectural shapes, constructed in prefabricated sandstone building blocks (similar to the Temple’s original material). Adeyemi remarked on the daunting challenge laid out before him as a modernist architect tasked with responding to a neo-classical building. “While observing the building, we realized that the internal void was really a great quality to reveal, and so our building is really an inversion of that,” he explained. 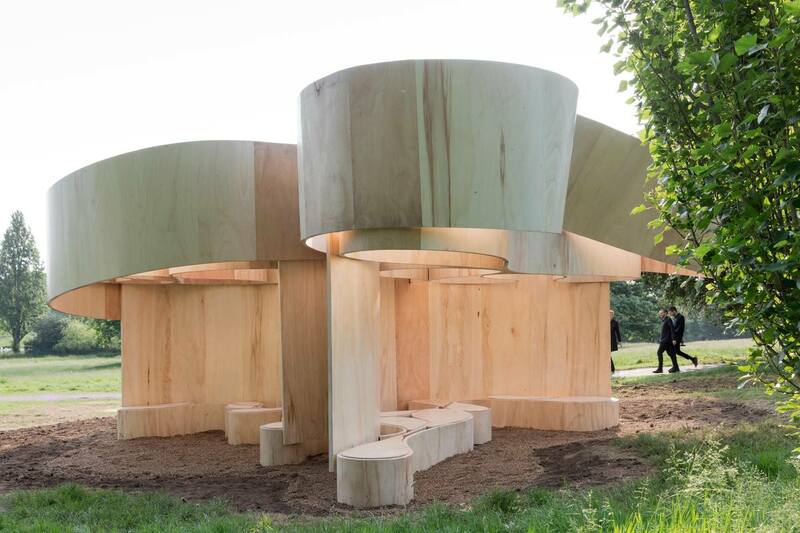 “In a way, it’s a rotated from of the temple that highlights the interior space and also creates the fundamental purpose of what we think a summer house is: a place for shade and relaxation. Kunlé Adeyemi (NLÉ) in front of his Summer House. Image credit: Robert Urquhart. 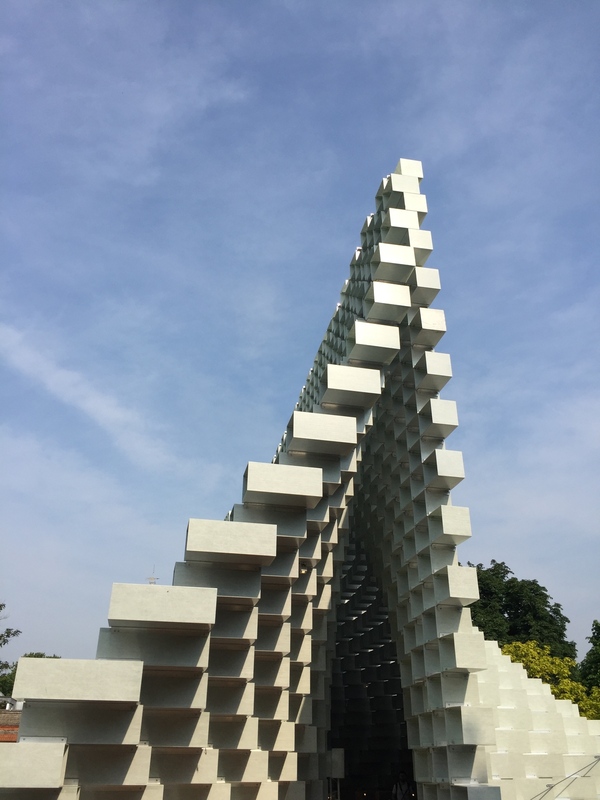 We then transitioned to Yona Friedman’s pavilion, a series of stacked cubic frames. At 93 years of age, Friedman is the oldest architect in the group. He took the opportunity to further explain the thinking that has propelled his life’s work, and the origin story behind the structure. Yona Friedman in front of his pavilion. Image credit: Robert Urquhart. I wanted to create a summer house which reimagines what William Kent would do now. Finally, we moved to the last Summer House designed by Barkow Leibinger, which Frank Barlow described as “a dialogue and a continuation”. “For us it’s a prototype. 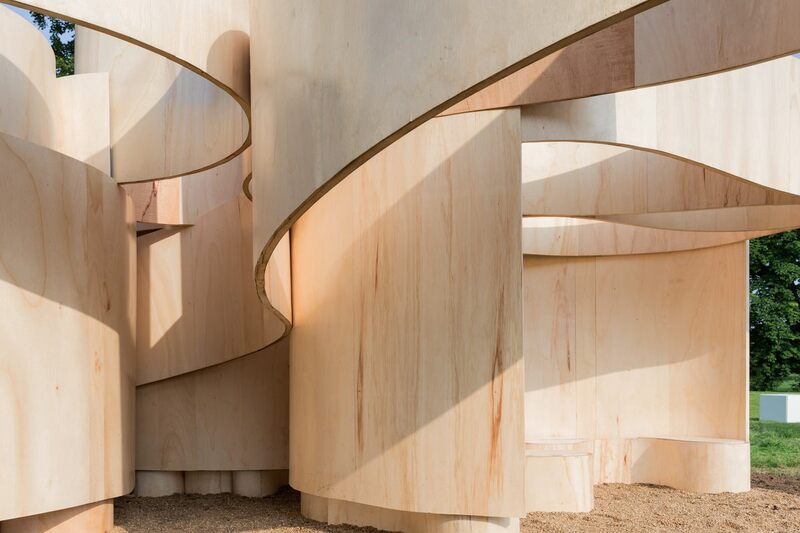 For us, a prototype means it will have another life,” he explained, describing the undulating, seemingly infinite wooden band folding and looping its way along itself, that forms the entire Summer House. 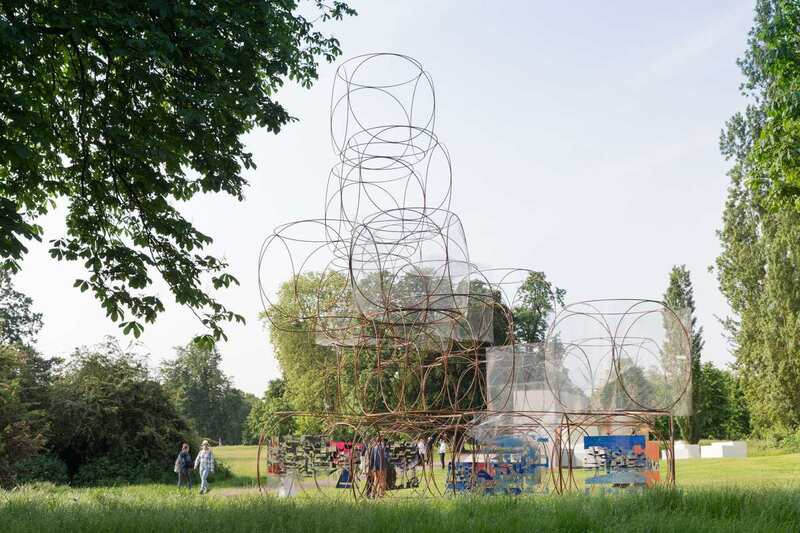 The Serpentine Architecture Programme, including the Serpentine Pavilion and accompanying Summer Houses, will be on display to the public from 10 June – 9 October 2016.